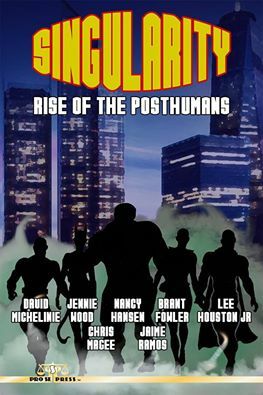 I am happy to report that my friendly neighborhood beta-proofreader Nancy Hansen is now in-between full recovery of the surgery on her left eye and the impending surgery on her right eye. Don't know if that means she'll resume her friendly neighborhood beta-proofreading service before she has to get ready for surgery on her right eye, but it will be something on the agenda to ask the next time I see her. Under the circumstances, she has yet to go over Chapter 6 on my latest efforts concerning HUGH MONN, PRIVATE DETECTIVE as I work on Chapter 7 in-between other matters that require my attention. 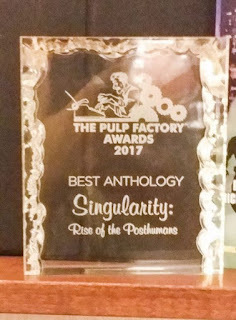 I'm also very excited to report that SINGULARITY: RISE OF THE POST HUMANS won TWO of the 2017 Pulp Factory Awards (for 2016 material) Friday night at the Windy City Pulp & Paper Con. David Michelinie won Best Short Story for "Lord Pemberton's Adjustment Service"! 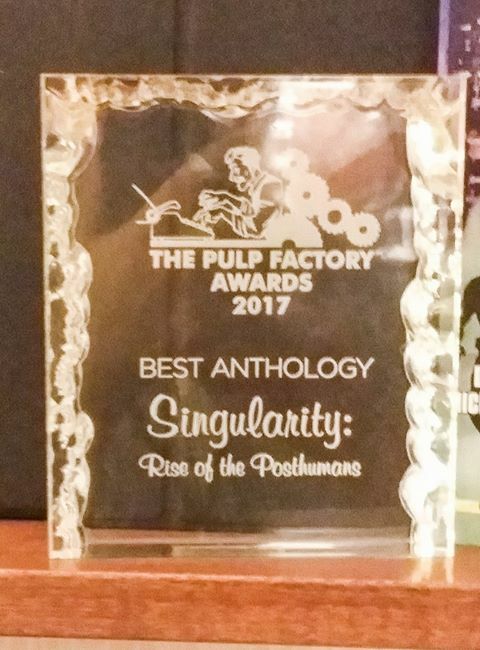 ...and SINGULARITY itself won Best Anthology! 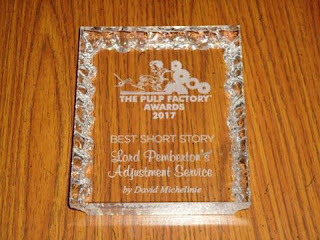 So a big thank you to our readers, fans, and voters from David, Jennie Wood, Nancy Hansen, Chris Magee, series creator/editor Jaime Ramos, along with yours truly! Going back to writing now.